OSHA has engaged in a furious flurry of press activity over the past month. Well, “furious” by Trump-OSHA standards. By anyone else’s standards, it’s still pathetic. OSHA has issued an astonishing total of six press releases since the beginning of August. This is, of course, practically nothing compared with the more than 50 large cases that OSHA issued during that time. From what are they trying to protect the sensitive ears of American industry? Who can tell? First Dakota Enterprises Inc., of Fort Pierre, SD has received proposed penalties of $95,064 for failing to protect its workers from trench collapse hazards. A 34-year-old worker narrowly escaped death after he was completely buried when the walls of a 14-foot trench collapsed around him last May. Co-workers quickly freed the victim’s head, which allowed him to breathe while emergency personnel worked for more than 30 minutes to free him. OSHA cited the company, which was contracted by the City of Emery to replace the city’s main sewer and water lines, for two repeat and one serious safety violations. Felker Brothers Corp., a Marshfield, Wisconsin manufacturer of steel pipes and tubes faces $110,458 in proposed penalties after OSHA found 13 serious safety and health violations following a worker complaint. At least one employee at the facility was exposed to excessive levels of hexavalent chromium, which can cause serious health issues, and another worker suffered severe injuries after being struck by a moving piece of machinery. Hometown Foods USA – a Medley, FL, commercial bakery doing business as Bagelmania Inc., faces $129,145 in proposed penalties from OSHA for exposing workers to amputation, fire, and noise hazards. OSHA cited the employer for 16 serious and other-than-serious safety and health violations after receiving a complaint alleging machine-guarding, forklift, and noise hazards. The company also was cited for not providing employees’ formal training on operating a powered industrial truck, failing to inspect powered industrial trucks for defects prior to putting them into service, and improper use of electrical cables. While we praise the agency for slowwwwwly recognizing that workers (and employers) may benefit from hearing about some workplace safety and health cases, we are still confused about what the criteria for a press release is, especially since there were at least six other large citations over the last month and a half that, for some unfathomable reason, did not merit their own press releases. Is there any rhyme or reason for OSHA not issuing citations for these large cases? Did these employers express sufficient remorse while the others didn’t? Did they contribute to someone’s political campaign?Without some kind of process or criteria, my inquiring mind wonders in all directions. Fort Miller Fab3 Corp. of Greenwich, NH, received $34,404 in proposed fines from OSHA for the death of an Argyle man in a workplace accident last October. The company reached a settlement with OSHA for $25,803.45-year-old Daniel J. Ingram was killed last October when he was crushed by a 7,000-pound steel box that was fabricated at the company’s Wilbur Avenue plant. The OSHA report on the fatality shows that the box was on a forklift that lifted it 10 to 18 inches off the ground, and when Ingram stepped out of it through a door, it tipped over because the forklift’s forks did not extend the length of the box. Ingram was pinned between the box and a paint tank, and died from severe trauma. Seven co-workers lifted the equipment off him, but he was pronounced dead a short time later. OSHA issued three “serious” citations to the company for equipment or safety violations. Custom Truck and Auto Shine Inc. of Fargo, ND is facing a $12,000 OSHA penalty for a serious violation following the death of a man in a work-related accident in February. Forty-one-year-old Nathan Martinson, of Fargo, was pinned between two trucks after a co-worker backed out of a garage and didn’t know Martinson was there. Martinson died at a hospital emergency room. 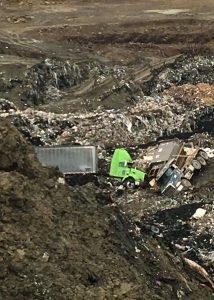 Advanced Disposal, of Elk County, PA, has been assessed a $12,675 penalty for a serious violation found in February, six months after the collapse of a wall at an Elk County landfill took the life of a 49-year-old DuBois man at Greentree Landfill in Fox Township. The collapse resulted in the death of William Pierce, one of the company’s equipment operators. The company failed to take appropriate precautions and remedial measures in response to the cracks that repeatedly appeared in the landfill which indicated that the soil, waste, and sludge therein were unstable where Pierce and others were working that day. Pierce, who had worked at the landfill for 18 years, was driving a garbage compactor when trash slid down and covered the machine. He died of compressional asphyxiation as a result of environmental entrapment. Otis Elevator Company is being fined nearly $40,000 after a man died while working on an elevator at Tallahassee Memorial Hospital. This comes after 60-year-old Robert Myers, an elevator technician, was accidentally killed in February when he was called to fix a broken elevator. The proposed penalties total to $38,025. Oncor, a Tyler, TX electrical company, was issued one serious violation, with a penalty of $12,673, for the electrocution death of a worker who came into contact with a live wire on Feb. 1 and then made contact with the other worker, transferring the shock to him as well. One worker survived and the other died. Viafield, an Iowa agricultural services company was assessed a $4,000 penalty for a May accident that killed a Winthrop worker who was was buried while moving soybeans while blending wet and dry soybeans and moving them between silos with the help of a gravity-fed wagon..
Graniterock, subcontractor Hildebrand & Sons and Caltrans (the California Department of Transportation) received close to $50,000 in fines for the death of a worker on Highway 17 in Santa Cruz County after one of last winter’s strong rainstorms. A dump truck backed over and killed Graniterock employee Robert Gill and seriously injured 33-year-old Stephen Whitmore. Graniterock received more than $32,000 for failing to ensure that hauling and earth-moving operations were controlled in such a manner that the driver of the dump truck, run by subcontractor Hildebrand & Sons Trucking Inc., knew that Gill and Whitmore were in the area. Graniterock also received citations for not doing enough inspections of the job site and for training and safety failures. Hildebrand & Sons was fined close to $24,000 for several similar violations. Cal/OSHA fined Caltrans $750 for failing to conduct safety inspections on the job site. Davidson County government was issued three citations and fined the $6,500 by the Kentucky Occupational Safety and Health Administration (OSHA) in relation to asbestos issues in the Davidson County Courthouse, according to a press release. According to the release, the citations say the Davidson County government failed to inform building tenants and employees of the Davidson County Courthouse regarding the presence, location and quantity of asbestos-containing material or presumed asbestos-containing material. The citations then states the county did not ensure that a person conducted an exposure assessment immediately before or at the initiation of class III asbestos work. Squaw Valley Ski Holldings LLC was issued two serious violations by CalOSHA for an accident at the Squaw Valley resort last year in which ski patroller Joe Zuiches, working on avalanche control operations, was killed after exploding a hand charge containing ammonium nitrate. In its citations, the charge was described as weighing 1.8 pounds with a cap and fuse with a 90 second burn rate that exploded near Zuiches’ torso. The resort had failed to implement a safety procedure associated with hang cord entanglements during hang cord blasting operations, Cal/OSHA said. The penalty for the violation was $11,250. The second serious violation was that the snow avalanche blasting crew failed to ensure that all crew members maintained visual contact and awareness of the location of all workers during avalanche control activities, Cal/OSHA said. The penalty for that violation was $9,000. SpeedVegas has received fines of $16,000 from Nevada OSHA after a Canadian man and an instructor died in a fiery crash of a high-performance Lamborghini in February. The agency says that the track had a substandard fire and safety plan and failed to properly train employees in fire suppression. Triumph Processing – Embee Division, Inc., a Santa Ana, California aircraft parts manufacturer, was cited by Cal/OSHA for $87,500 for numerous workplace safety and health violations including failure to provide workers with effective training on hazardous chemicals in their work area and willful failure to notify workers of their exposure to hexavalent chromium, a hazardous chemical known to cause cancer commonly referred to as chromium-6. Cal OSHA found that the employer had previously determined through air monitoring that workers who sanded and spray-painted aircraft parts were exposed to high levels of chromium-6, in the form of dust and mist. Cal/OSHA issued a willful regulatory violation to the employer for not posting or notifying affected workers of the air monitoring results, and for failing to advise the workers of how they would be protected from exposure. The inspection was the result of a worker complaint. Cal/OSHA issued a total of 23 violations, including one willful-regulatory, six serious, six general and 10 regulatory in nature. Bay Area Athletic Club has been fined nearly $200,000 by the Oregon Occupational Safety and Health Administration, according to documents obtained by The World. The $195,300 failure-to-abate penalty brings the total violations for the Coos Bay-based gym to $574,110. The most recent fine stemmed from a failure to provide proper emergency eyewash and shower facilities, with the original violation dating back to Sept. 14 of 2015.The proposed daily penalty is $300 until the violation is corrected. And for those of you who want to do your own research, here is a list of every citation greater than $40,000 issued by federal OSHA or state plans since last January 20.